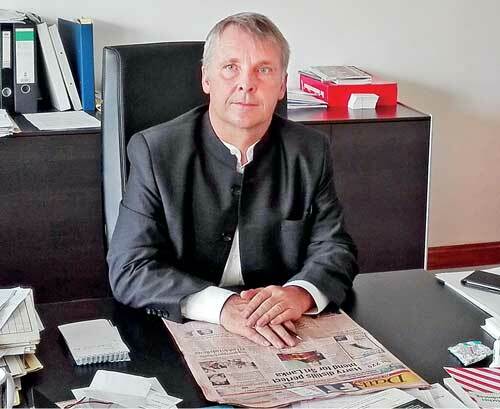 Germany’s Ambassador to Sri Lanka, Jorn Rohde is a strong believer in how pluralism and multi-culturalism can build successful and peaceful countries. In an interview with Daily FT recently, Ambassador Rohde addressed the controversy surrounding the regaining of GSP plus concessions that are tied to certain human rights and democratic conditions, saying the decision to apply for the import duty concessions is purely Sri Lanka’s decision as a sovereign state. In considering eligibility for GSP Plus, the EU merely measures the country’s compliance with international conventions and human rights commitments Sri Lanka has ratified on its own, he explains. Ambassador Rohde also hailed Sri Lanka’s democratic transformation since January 2015, but also said he understood public frustration about the pace of reform and progress on reconciliation. In this the Government still has work to do, the German Envoy says, adding that “credibility is a politician’s greatest capital”. Q: You have been in Sri Lanka a few months now. What do you think be the key focus areas of the German Embassy’s engagement with the Sri Lankan Government going forward? A: Germany and Sri Lanka have a long history of relations. When the new Government in Sri Lanka came into being I was still in Bangalore. I just came last summer from my previous posting. Shortly, Germany is and always will be a reliable partner to Sri Lanka in its path to economic modernisation and democratic reform. This Government has laid out commitments during the election campaigns and its manifesto. There have been achievements like the Right to Information Act, the OMP, reconciliation procedures, but there remains a lot to do. The German Government gives support Sri Lanka and give advice and options available if asked, through our development cooperation GIZ, active in vocational training. We opened a centre in the north in Kilinochchi. Yesterday I met with former President Chandrika Kumaratunga, she participated in the event together with GIZ on the reconciliation festival Wings. We do little things on the ground that all contribute to the general policy, which we fully support. One very important thing we want the same thing as Sri Lanka – Democracy and Development. Some countries only offer development – like your bigger neighbours in Asia. But we say that Sri Lanka deserves better, and it’s great that the Prime Minister and the President says the same. We want democracy, freedom and development. This is the more sustainable path. Because what is development worth without freedom of information or freedom of the press? I have only been here half a year. I experienced total freedom. You can discuss anything. And that is all very good, but sometimes you will have to say do what you say and say what you do – and there of course there seems to be a lot of challenges. Q: There seems to be a lot of pessimism on the ground about the Government’s intentions to keep its promises on economic and democratic reform. But the diplomatic community here continues to take a much more optimistic approach. Why? A: When you are at home, you are always more critical with yourself than when you are looking in from the outside. When I am home as a German citizen I also criticise a lot of things that take too long. So I think a natural reaction. But we of course see the development of the last year. There was no Right to Information Act. There was no willingness to fully reach out to the international community or to reconciliation. There was a reason that the previous Government was voted out. The new Government was voted in with a lot of hope. Democracy is sometimes three steps ahead and two steps back. And sometimes three steps ahead and three steps back! I read this morning the Daily FT had an interview with the Foreign Minister and in Page 4 there is an article on TNA Representative Sumanthiran, where again there is a gap between work and action. There the Government has to be faster. Land return and compensation. People of course rightly criticise. It’s in the paper every day. But democracy also needs real results and there the government has to be faster. Q: There’s a growing sense here that the Government is under pressure to bring about reforms perceived as being “inimical” to the country’s culture – like the decriminalisation of homosexuality – due to pressure from the EU which is making GSP Plus concessions conditional on these factors. Is this a fair criticism? A: GSP Plus is a unilateral trade concession by the EU. Governments can apply for it. No one is forced, it’s a sovereign decision of Sri Lanka or whichever other country. Currently eight countries benefit from it. Sri Lanka was benefiting from it. But it didn’t adhere to its own commitments and that’s why the EU withdrew the concessions. The new Government with its commitments to human rights and reform, said we want to reapply, because Sri Lankans lost income when it was withdrawn. When you reapply for it, you need to fulfil the commitments Sir Lanka has ratified. It’s not an EU commitment - Sri Lanka has ratified several human rights conventions. GSP Plus granting looks at implementation and enforcement of these conventions. It’s purely your decision. You want something and when you get it, you have to do your homework, that’s it. I think we are on a good path. Government is committed to reforming the Prevention of Terrorism Act (PTA) or the Amendment to Criminal Procedure Code. Could be faster, that is why the European Parliament is going to extend the consultation period for another two months – the decision will be in May. But I think the Government is willing to do this reform. It’s only what they said when they were campaigning. The question is how fast you are. And there are challenges there. The EU is a community not only of free trade and common markets, but also of values. And we remain open that is the main message. GSP plus is part of that message. Sri Lanka is very strong in the garment trade. Bangladesh and Pakistan have seen great increases – they also go up the value chain. The EU has finished free trade negotiations with Vietnam and Singapore. We signed Canada, after a lot of discussion. The main message is that we are open for business, but it’s also about values. Ascension negotiating with the Balkan states to join the EU. Of course becoming more diverse makes the EU more complex. Xenophobic parties, refugee problem, and terrorism challenges. When you look at the full picture we have been quite a successful model. When it comes to economic integration – in this part of the world we talk about free trade agreements. Free trade is the lowest form of economic integration, which we achieved in Europe already in 1958. Ten years later we had a customs union. Then the common market, now we have an economic and monetary union. There is a complexity that has never been achieved in the community of independent states before. Even there, it’s sometimes two steps ahead and two steps back. Europe has seen 60 years of peace through that, and economic prosperity. That’s not a bad result overall. Q: In terms of winning back the GSP Plus concessions, which areas of reform would you press the Government to work on as a priority? A: There are areas where you don’t need arduous legislation like reconciliation, Land return and compensation. That could be done faster. There are strikes in the North because land has been promised to be given back, but it hasn’t happened. I would urge the Government to show more action and that creates the atmosphere of trust needed, so people see sometimes it doesn’t happen tomorrow, but it happens. If for two years there is no action, people ask if there is still a commitment. Again they need to follow their own promises. It’s simple as that. Credibility is the most important capital you have as a politician. Q: There is a mixture of fear and hope here – depending on whom you’re talking to – about the fact that the new US administration will put less pressure on the Sri Lankan Government at the Human Rights Council and otherwise to deliver on its commitments on reconciliation and justice for grave violations of human rights. If the US Government doesn’t take a lead on pushing for the implementation of Sri Lanka’s pledges on these issues, do you think Germany will have a bigger role to play going forward? A: Germany has always been voted as a member of the UN Human Rights Council. The country has a sustainable and good record. We respect human rights whether it is in the EU or worldwide. But in the end it is a question for Sri Lanka itself. That has been our foreign policy for years; we actively address human rights and encourage countries. This has nothing to do with interference. We address human rights in China and Russia. There will be reactions if commitments are not kept. We are under a regime ourselves. The EU and most European states have set up the European Court of Human Rights in Staatsburg – any citizen can complain and even Germany has been censured there. Again this Government was voted in because of some failures in not adhering to human rights conventions and because reconciliation did not progress. That is why they were voted in – to make a successful policy especially on reconciliation. Reconciliation means a stable democracy and it also means a good outlook for economic development. So it’s basically also purely self-interest. We can only say the options, we don’t tell Sri Lanka you have to follow this model. You have to decide what kind of voting system, and what kind of governance set up you want. Whether you talk of federalism or devolution, in the end these issues arise because minorities have certain demands and you have to reconcile them. You can look at the Indian, Canadian or German models. But you have to decide what is best for Sri Lanka’s future. Q: There’s all this talk of power sharing in a new constitution now, but in Sri Lanka’s south there is still a great fear of devolving power under a federal system. Speaking from the German experience, how would you allay those fears? Do federal structures put a country at greater risk of facing secession of one or more of its parts? A: I lived in a lot of countries which have minorities. I was born and raised in Switzerland, where you have 70% German speaking, 20% French and 5% Italian. Every community has its own rights, but there is a strong sense of nationhood. Every minority respects the other. It starts with language learning, you learn each other’s languages. The Government also enforces that in schools, so you grow up multi-lingual. I came from India, where people speak four or five languages. Language is not a political statement but a tool to communicate. So if this develops here more, I think issues can go away. When you don’t address issues, the situation can become difficult to manage. Even in my own home province in Germany, we have four official languages. It shows the minorities that if I want to go to court and speak my language, I can do that. The opportunity to do that itself does so much for reconciliation. If people can go to police and court and address their grievances in the language they speak at home. That is possible in Germany, in Canada, in Switzerland and in Australia – it has nothing to do with sacrificing national unity. All these countries are very successful models. When you look at countries with devolution, they are successful models. Even in India which has hundreds of ethnic groups, hundreds of languages, that has been quite successful. The level of Government that can do a task best should be responsible for it. In most countries, education is a matter for the province. What federal means is multi-level Government, you organise it where competencies can best be provided, and the province becomes responsible and takes ownership of its affairs, like trade promotion etc. That does not mean this is a problem for national unity. Q: On electoral reform, Sri Lanka is looking very seriously at the German model of mixed member proportional representation. Is Germany offering the committees tasked with drafting these reforms any assistance towards building this framework? A: First I would say every democracy should choose the system which suits it best. In Canada they have the Anglo-Saxon first past the post system. In Germany we have always had a mixed proportional representative system like most countries in Europe because it also guarantees smaller parties representation. It depends on how it is modelled. In Germany you have the constitutional court which purely checks if constitutional regulations are being respected, there we have given countries advice – for instance South Africa modelled its constitutional court after the German one. We only give advice if asked and we share our own experiences. Q: But have members of the Steering Committee appointed by the Constitutional Assembly to draft the new constitution reached out to the German Government for support? A: We are in contact with players who are looking at different models. But in the end it is the Government that decides. Same with awareness campaigns, foreign NGOs work together with Sri Lankan players. This year we will probably send a delegation from the Sri Lankan Parliament to Germany, because they have asked advice how to empower parliament – what is the role of committees, does the winner take all. For instance, in Germany your representation is based on party strength. Traditionally the most important committee in Germany, the budget committee is always headed by an Opposition member. But in Canada committees are always headed by a Government member. This doesn’t mean that it’s not democracy, it’s just the system and there are many options. I think the Germany Parliament is working together through the Naumann Foundation with the Sri Lankan Parliament for instance to improve access to MPs to a library, to make Parliament more powerful. IN a lot of spheres we work together with NGOs. On constitutional reform we are in contact with people from all parties. It’s abut presenting options and in the end Sri Lanka has to decide what to take and what not to take. We are all democracies. As a democratic country ourselves, we want Sri Lanka to succeed. Q: Clearly the Sri Lankan Government is keen to attract FDI. Do you think it makes sense for German companies to invest in Sri Lanka? Is that something you would encourage companies to do? A: We have seen double digit growth in trade volumes in the last two years. In the last three quarters of last year, German exports rose 25% to Sri Lanka. Sri Lankan exports to Germany also in double digits. When GSP Plus comes you can see an increase in volume. Based on these trade figures, we reached nearly $ 1billion in trade, up from $700 million from the end 2014. There is potential to go up, but it has concrete results. We are setting up a Chamber of Commerce office here. We had two trade delegations from Germany last year for the first time in 10 years. That is the positive side. Sri Lanka talks a lot about becoming a hub in the region. In order to be a hub, you have to be very competitive compared to your neighbours. When you look at all the indices, like the Corruption Perception Index which was released last week, Sri Lanka’s balance sheet so far is not super-convincing. The Government knows this. In the budget there have been incentives and talk about improving the ease of doing business here. But again talk is not enough, you have to show action. When I deal with German companies here, it’s still an issue with fair and transparent tenders, norms and standards. Investors are coming, but it could be faster. Especially tender procedures should be fair and transparent. Tourism for example, numbers are booming, last year alone more than two million came, Germans increased by 15%, but everyone grew double digits. That’s a very good story. But tour operators complain to me that departure taxes were raised last year with two days’ notice. I’m not saying you can’t raise revenue. But if you do it with a two day notice, it’s not sustainable. The Tourism business plans the season and does their calculations ahead of time. Suddenly you slap a market which has very low margins with a $ 60 increase in taxes that wipes out profits. So then you think maybe it’s not a good place to invest if they have these erratic decisions. You need sustainability. People who invest have to know what is happening. Singapore is a high income country and it’s really expensive to invest there. Germany is also not the cheapest place. But we have a business environment which is in a way reliable. You know the laws. You know there is enforcement. This region in the world is the least economically integrated. The good thing is the Government is addressing that, they are into free trade negotiations. Again, Sri Lanka is already a hub in maritime transport. In order to increase other areas, you need to be 50% better than your neighbours, like Singapore is. Q: The Volkswagen controversy really blew up recently; was there ever really a plan for the German automaker to build an assembly plant in Sri Lanka? A: Some years ago there were talks. But when this agreement was signed it was not signed with Volkswagen. There were two parties but not Volkswagen. Since I came here I had no indication that there were plans to set this up. We told people we don’t have an indication on that. Sometimes MoUs are not realised. The people who sign the agreements must know on which name they sign it and whether they really have the power of attorney to sign it. That was apparently not the case. Q: Is there any chance this plant can attract car companies like Volkswagen in the future? A: Speculation is difficult. In the end the question is about foreign investment in the manufacturing area. You need a business environment which encourages that. For me the most logical foreign investment in that sector should be from the neighbour. But why is it not happening? Is there a tax structure or a customs structure? When you are a factory you need components. It’s not enough to have assembly, you need brakes. But brakes may be slapped with a 200% import tax. Deputy Foreign Minister Harsha De Silva recently compared Sri Lanka and Vietnam since 1990 and now. Sri Lanka still has the same portfolio of exports since 1990, but Vietnam has branched out heavily into other areas, not only coffee but also manufacturing. They have realised that you need a tax and incentive environment. Sri Lanka has not yet done that. Q: What steps should Sri Lanka take to become more investment and business friendly? A: Hopefully the free trade agreements will open up the economy. Of course, trade needs to be fair and transparent. Opening up doesn’t mean foreign investors get it all. They just want reliable conditions. Sri Lanka doesn’t have to be only about tea or rubber or garments. IT is a promising sector. One of Sri Lanka’s main attractions as a hub is its location, social indicators like health, literacy and infrastructure. I was in Bangalore where there are five power cuts a day. But people still go there because they have the IT environment. If you create this, the hub is at the door, because the infrastructure is great, pollution hardly comparable to other Asian cities and it’s easy to get around. Government is trying to bring about the megapolis and a good public transport system. That is what people in the rising middle class also want. They want to enjoy life, and in a lot of Asian cities that is more difficult. If you have that, people would come.